In less than two weeks, all eyes will be on the Mobile World Congress in Barcelona again. Videantis would like to invite you to our meeting room in Hall 2, where we’ll be showing our latest video coding and computer vision demonstrations. High-performance and low-power operation areabsolute requirements to bring new video and vision-enabled user experiences to smartphones and tablets. Compared to a host CPU, our unified video/vision processor IP yields a 100x performance increase and 1000x power reduction. Key computer vision algorithms such as face detection, feature detection and tracking, skin detection, and OpenCV acceleration. Our video coding solution that supports multi-format, low-delay, and 10/12-bit Full HD and UHD/4K codecs. Our unified video/vision platform integrated with an Android-based tablet. The Mobile World Congress 2014 takes place in Barcelona, Spain from February 24th to 27th. We have a limited amount of free visitor passes that we can hand out. Please contact us if you’re interested. Videantis will be located in Hall 2, meeting room 2B12MR. To set up a meeting with us, please email sales@videantis.com. More than 3200 exhibitors and 150,000 attendees joined the CES circus this year, making it larger than ever before. With 30 customer meetings in our meeting room in 4 days, we didn’t see much of the show floor though. Instead, we concentrated on our customers, discussing our high dynamic range, low delay, and multi-format video codecs. Our computer vision acceleration solution, running algorithms such as face detection, feature detection, and optical flow, key algorithms for applications such as gesture recognition, automotive driver assist systems, and augmented reality caused a lot of interest too. Read our first CES report that comments on the CES daily news magazine’s article “CES to spotlight more varied tech than ever before”, highlighting the following technologies: 3D printing, driverless cars, health technology, sensor technologies, Ultra HD TV, and wearables. Read our “one month after” report that highlights the key trends and announcements from CES that will stick: Android is coming to your car, TVs are alive and kicking again, Kinect’s offspring: depth sensors and gesture interfaces, and consumer drones. 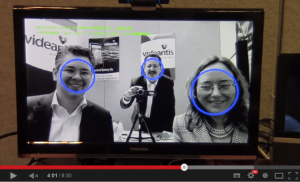 Jeff Bier, founder of the Embedded Vision Alliance visited our demonstration room at CES. We spoke about our parallel video processor and walked him through our demonstrations. Watch the video interview and demonstrations. We also demonstrated our products at the Embedded Vision Summit in Boston. Among others, we showed our feature detection running on HD resolution camera input, as well as an optical flow implementation, using the Lucas Kanade algorithm.Watch Mark Kulaczewski demonstrate our real-time HD vision system. The Embedded Vision alliance shot product demonstration videos of us before. See our videos from July 2012 and December 2012.